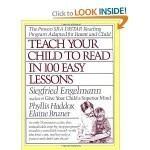 How to Teach Your Child to Read in 100 Easy Lessons! When I first thought about homeschooling I felt overwhelmed and was not sure where to really start. We started going to a lovely homeschool meet-up in our area and I met some incredibly supportive and friendly mom`s there. After talking with many of them and since talking to many more mom`s that home-school – I learnt the one book your preschool curriculum just can`t do without is Teach Your Child to Read in 100 Easy Lessons ! Our family loves this book – it is honestly worth every penny you spend on it. We used it with our daughter and before the book was finished she was reading! The lessons are straight forward and easy to follow once you have the basic lesson plan structure down. We tended to skip the writing practice to help make the lesson a bit shorter as our daughter was 4 when we started the book. I have since this this book in many of my friends homes – you can always tell it has been well loved and used through the children! If you are only going to buy one book for your preschool or kindergarten curriculum this is the book to buy!